Several tents dotted the "Here-There" homeless encampment on the Berkeley border this past spring. City officials aim to build more transitional housing to move people off of the streets. The city of Berkeley passed an innovative new proposal to build more transitional housing for homeless residents this week — and officials say they plan to put a measure on the 2018 ballot to help pay for it. On Tuesday, city council unanimously voted to fund 100 new beds at city-operated temporary and transitional-housing shelter, to the tune of approximately $2.5 million a year. The plan, referred to as a “hybrid” model, was one of four proposals under the city’s “Pathways Project.” Council voted for the lower-cost alternative. Specifically, the funding would combine a proposed STAIR Center, which will provide twenty beds and focus on providing temporary shelter for homeless individuals, and a Bridge Living Community, which will feature 80 beds and connect individuals to permanent housing. A location for this facility is not yet determined. The housing will be constructed in the form of a “tent village,” using bungalow-style tent-cabins, along with port-a-potties, mobile showers, trailers for office and storage space, and security fencing around the perimeter. Each cabin would house eight people. The project also includes funding for the first phase of Homeward Bound, a program that will help homeless individuals connect to friends or family who can offer permanent housing. This program also funds one-time travel expenses to relocate, including 100 travel vouchers every year, as part of a pilot program. Several councilmembers stated that they see Pathways as part of a broader city effort to address homelessness. Ongoing city plans include the ambitious Berkeley Way project, which is slated to create 89 affordable units, 53 permanent supportive housing studios, and 53 shelter beds; and the Step Up Housing initiative, which will create up to 100 units of supportive housing. Mayor Jesse Arreguin said the plan will help to focus on getting people out of encampments and into better living situations. The increase in transitional housing, he said, will also make it easier for the city to connect homeless individuals to rapid-rehousing. “When you’re living in the streets, the most treasured commodity you have is your privacy,” Sullivan said. 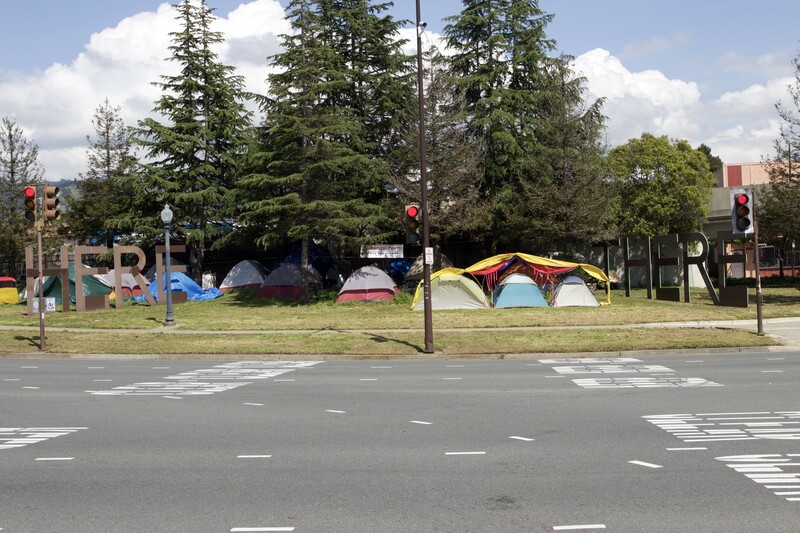 FTCFTH members live in tents near the “Here There” sculpture at the Berkeley-Oakland border, and everyone has their own tent. Arreguin, who co-authored the plan with Councilmember Sophie Hahn, said that they are looking to put a revenue on the ballot in 2018 to generate more funding for the project. Several private sponsors, Hahn said, have also expressed interest in donating to pay for transitional housing. Money from the city’s Housing Trust Fund might also go toward the program. “Addressing homelessness is a very expensive challenge. It’s an investment that we have to make, and really what we need is help of state and federal governments to assist cities,” Arreguin said at the meeting, making his case. The mayor also mentioned concerns that, under the current federal administration, housing and social services resources will be cut, leading to increased rates of homelessness. He and other councilmembers stated that passing Pathways now helps to get a plan off the ground before any potential budget constraints.